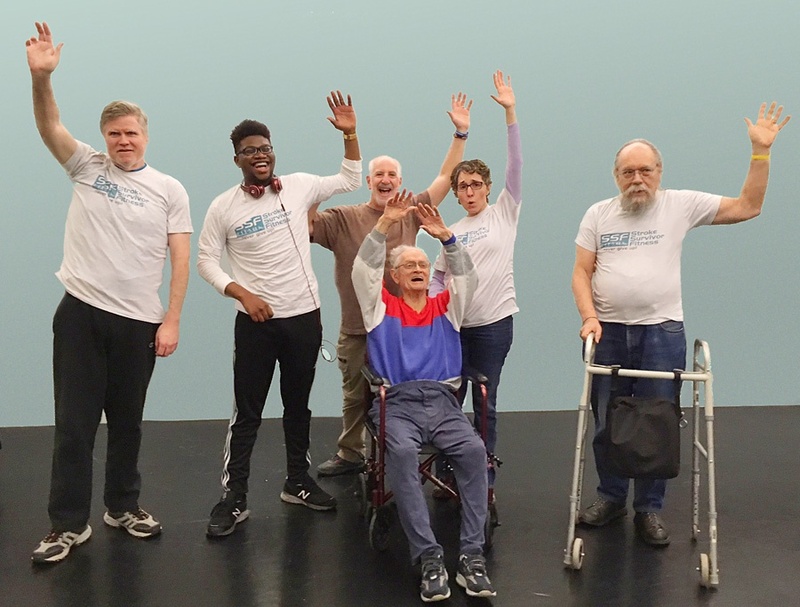 Because recovery and a healthy life aren’t just about regaining physical strength, every Stroke Survivor Fitness class includes a segment called Work Out Your Words (WOYW). These activities are designed to combine physical movement with speech and cognitive challenges. Classes help people with aphasia become more comfortable with moving and speaking at the same time. For those survivors who don’t have aphasia, the activities improve reflexes, coordination, and brain processing speed. Several of our WOYW instructors are survivors with aphasia. Leading the exercises helps them with word retrieval and improves their cognitive skills. Even if you don’t like exercise, these group activities that combine movement and speech are fun and challenging—like a talking action puzzle. On Friday, May 11, 2018, a special online version of Work Out Your Words will take place from 10:30-11:30 ET. Lingraphica will join WOYW at the Stroke Comeback Center for a special session, and YOU are invited to attend from the comfort of your own home! Just click here for the instructions about how to join in on May 11 to see what WOYW is all about. Not everyone has access to a group, so here are some easy and fun ways to improve speech and movement on your own and get some exercise at the same time. Take a walk. Count your steps out loud or say the alphabet. Improve your reflexes by bouncing a ball, counting out loud each time you catch it. Challenge yourself to catch more each time. Take part in your favorite sports from your chair! Help the officials make the right call. Use your arms to show the action and yell out the calls: TOUCHDOWN, SAFE, BASKET, TRAVELING, YOU’RE OUT! Do the wave—stand up from your chair and throw your arms in the air; cheer, pump your fist. Enjoy some music. Music is a wonderful addition to an active life. Conduct the orchestra—with enthusiasm! Play air guitar or follow along with the drum solo in your favorite rock song. Dance and SING. Join the Supremes and act out your favorite Motown song. Hold your hands together so your arms move as a unit. Use them to draw a rectangle, triangle, circle or figure eight. Move your arms all the way through what you are imagining. Write a word in space in front of you, drawing each letter. Play a guessing game with a friend. Make a drawing and see if they can guess what it is. Find a friend and play pat-a-cake. Recite the rhyme and do the moves. 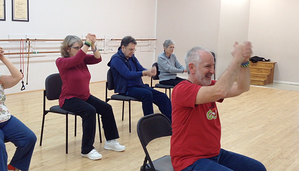 Movement across the midline of the body energizes the brain. Have fun with your movement and speech. For more ideas or to find out how to start a WOYW group, email info@wellpeer.org. Visit workoutyourwords.com and check out the Facebook page: https://www.facebook.com/strokesurvivorfitness.